I was fortunate to be sent a demo model of the Flite “tree tent” from Tentsile—their newest addition on their line of platform shelters. The Flite is their lightest, most compact, most packable shelter they offer, so of course I set out to test this on some backpacking trips of my own. I wasn’t too disappointed. *I removed the three steel carabiners and didn’t pack any stakes, which shaved a few ounces. The Flite follows all the Tentsile designs with a triangle base platform that uses three tie-outs to suspend it off the ground. The tent uses high tensile forces, similar to a slack line, to keep the platform surface taut and flat. The use of thick webbing straps is essential to protect the anchor points from compression. The integrated bug netting is held out thanks to a single aluminum tent pole. The matching rain fly is propped up by this same tent pole and is pulled taut at each pull-out. Additional tie-outs on the tarp keep the sides taut. The Flite is a two-person shelter, designed to be light and faster to pack and set up. One of the highest search terms that I see related to hammocks are for “two person” hammock shelters. It’s a tricky market because hammocks don’t usually lend themselves to couples unless you enjoy snuggling very intimately all night. 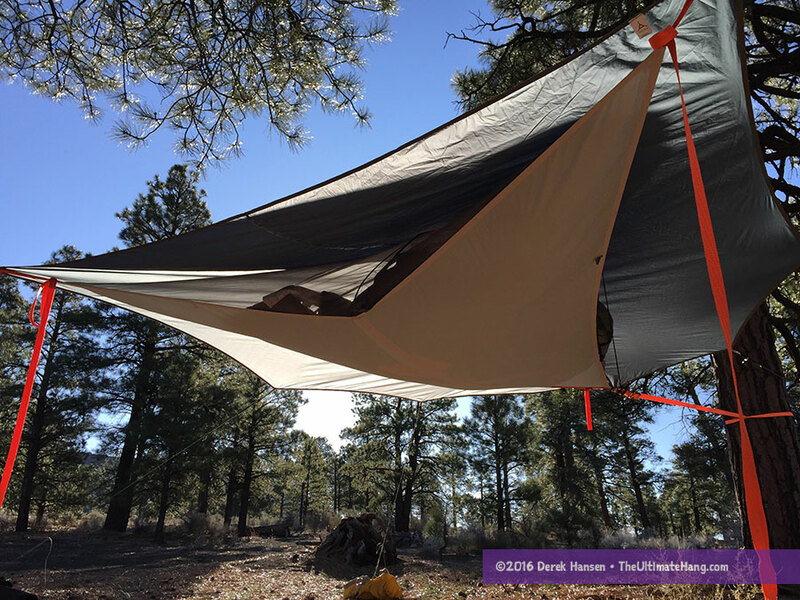 Other solutions, like the Clark Vertex, are essentially two hammocks hung side-by-side but with a tarp and bug netting to connect them. 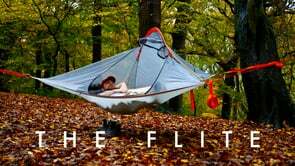 The Flite is the most comfortable two-person hammocks I’ve tested, and it is also one of the easiest to set up as well as the most accommodating to sleeping pads and sleeping bags that most people are used to. While the Flite is the lightest shelter Tentsile offers, it is still quite heavy compared with two basic hammocks slung side-by-side. It does have an appeal for those looking for a more traditional “flat” sleeping platform, but still want to get off uneven, gunky ground. Tentsile has produced a great little video that shows the proper setup of the hammock. You can pitch it a little faster than the 10 minutes they estimate, once you’ve had a little practice. I found that some time is lost in adjusting to get the straps level, or to raise or lower the hammock once you’ve been in the hammock for a few moments. The Flite works best with trees that are closer together. On one of our first outings, we found a perfect triangle of trees that were about 20 ft (6 m) or so apart, which still left us with ample tree strap length left. However, even after tensioning the straps as much as we could, the hammock really stretched and sagged quite a bit during the night and my son and I ended up rolling together in the middle of the hammock. The next time we set up the hammock we found trees that were closer together (12 ft/3.6 m), which worked perfectly. We found that it’s more important to have the head end of the hammock attached close to the two trees while the “tail” end can be further apart. This helps prevent the middle from sagging together and helps keep the tarp taut. This was the second best tip to help keep our two platform “beds” working as designed. Set up the Flite between 2 and 4 feet (0.6 to 1.4 m) off the ground. Any lower and you risk touching the ground. Any higher and it’s really difficult to get in. Set up the straps first and keep the hammock packed/rolled-up and attach one end at a time to keep the hammock from touching the ground. This will help save the fabric from any accidental snagging. The 1-inch (22 cm) straps are about 10 feet (3 m) too long. Even with the longest hang, we had a ton of left over strap. You could easily reduce the length, cutting off anywhere from 6 to 10 feet (1.8 to 3 m) depending on the trees you commonly use. You can safely remove the steel O-ring carabiners to save weight. You can tie directly on to the loops on each corner of the hammock. We used a slippery Becket Hitch instead of the Cow Hitch on two of the three corners, which I feel not only ties faster and easier, it is also easier to undo when it’s time to pack up. For extended use, if you do remove the steel O-rings, I would recommend getting some small continuous loops to attach to the ends/corners of the hammock to reduce wear on the main hammock. Continuous loops are cheap and easy to replace when worn. A reader recommended, and I concur, that you could save additional weight by switching the long webbing straps for lighter, yet equally strong, Dyneema cordage. The 0.125 inch (3 mm) Amsteel (Dyneema) line has a 2,500 lbs (1,134 kg) breaking strength, which factors in perfectly with the weight rating of this hammock. You could fashion Whoopie Slings or maybe even the Garda Hitch to tension. Shorter webbing straps could then be used around the tree. There is an adjustment strap under the hammock that can tighten the center line. This is helpful if you find yourself slipping into the center of the hammock. Tightening this center strap helps to keep the two pockets separate. My son and I had a lot of fun with this hammock. It was great to sleep next to each other, read books, watch a movie on my iPhone, and just chat together. The platform also has a fun “feel” to it and we like to refer to it as a “mini” alien tent. It really does remind me of being in a tree hut, elevated away from imagined marauders. While backpacking, it didn’t seem to drag me down too much in terms of weight or bulk. The pack size was smaller than my 2-person tent and I know of other ways to reduce the weight on this hammock after having used it a few times. Speaking of reducing weight, we can split the pack weight and bulk between two people by splitting up the tarp, poles, straps, ratchet, stakes, and hammock. It’s easy to sleep in different positions to get comfortable. Using traditional sleeping pads and bags is easy. The two corners on the head end are prime storage spots for gear. There are small webbing loops that attach to mesh pockets. It’s a great little storage area for shoes, extra clothing, or even a water bottle. The tarp doesn’t really have a good “storm” mode configuration. During one night we had some strong winds that would catch the tarp like a sail and billow it up. The side tie-outs are a big help, and site selection can help, but because of how the tarp is splayed out, it lends itself to catch the wind. The foot end is narrow. This was most noticeable when we put our sleeping pads into the hammock. My son used a large, thick EXPED pad and I used a thin closed-cell foam pad. This combination worked pretty good because my smaller, thinner pad could slide under his. However, his pad jumped the center line and I ended up having my feet and lower legs on his pad. Two large pads would have been more challenging. For continued use, I would recommend getting some closed-cell foam pads and cutting the foot end into a taper to eliminate some cross over. Two big pads can work, but you may find that your legs and feet will drift to one side. The head end slopes in one direction and doesn’t cradle or center your head very well. If you lay on the right pocket, your head will roll to the right. Lay on the left, roll to the left. We found that pillows were essential to keep comfortable, even with a pad. As you might expect, when one person moves, the entire shelter moves. In practice, this was most noticeable during entering and exiting. During the night I didn’t have any issues, but much depends on what kind of sleeper you are and if you wake easily with movement. It is essential that this hammock get pitched taut or tight between each anchor point. This hammock is not designed to hang with a sag like traditional Mayan hammocks, which is counter to people familiar with hammocks might be used to. That said, all material stretches, and while the Polyester used in the Flite has less stretch than other fabrics, the longer the distance between the anchors, the greater the total stretch. After my own testing, this is why I recommend finding trees closer together, and also understanding how to adjust the bottom strap. It is also essential that you pick thick, mature trees that have resilient bark as your anchor points. The Flite, like all of the Tentsile products I’ve seen and used, is of the highest-quality. I found no loose threads, and all the seams are straight and even. I was also pleased to see that the bug netting was designed with enough gusseting so that the zippers and pulls tracked easily and evenly around without any strain on any seams, even when the hammock was loaded. The floor fabric is lighter than the other Tensile products, but it is adequately rated for the occupant use. I would just be more careful about making sure the material is kept away from abrasive objects on the ground. Seems like adding the strap ratchets would cause more stress to a tree. Thanks for the detailed write up. I’ve been thinking about purchasing this tent, and there aren’t very many reviews up yet, so this was super helpful. Regarding your recommendation for using Dyneema cordage to replace the webbing, wouldn’t that hurt the tree, since there is a lot of force needed to keep the tent taut and the thinness of the cord could cut into the bark? I think I read somewhere on the Tentsile forums that this is why they still use their wider and heavier straps — to prevent the trees from becoming damaged. Sorry for the confusion. I wasn’t meaning to get rid of the protective webbing for the tree. Just reduce the webbing length and use dyneema instead. Just like with regular camping hammocks. Do you think it would be wise to purchase the tentile ladder for it if you were to be higher up? Is it compatible with it? There are no attachment points on the Flite. You could probably rig it, but I wouldn’t recommend it. Also, since this version doesn’t have ratchets on each end you’d have to modify that as well do you could tie off and tighten from a distance. 2. If you can’t find trees that are well position, is it possible to run s rope between two trees and attach the Flite to it? I’m guessing you would make a loop a the point which gives you the best alignment. Yes, you can pitch these on the ground. I suppose you could try to split the difference with another strap. I have purchased this tent and a mini-t hammock. Do you think the mini-t is necessary for added insulation on the bottom? You can use a regular pad in a Tentsile. I received my flite yesterday, put it up, used it for 30 mins, took it down, and found that the tent pole was bent at the third section from the head end. Is that a common problem? It is still usable, I am just wondering. Interesting. I’ve not had that issue. Contact the manufacturer. They have really good customer service. Hi Derek, thanks for the review. Didn’t see any vents, how about condensation? I would like to know about this as well. I noticed on the reviews that most people are NOT using this tent in extreme cold. Since that is the only camping/backpacking that we do I need to know if condensation is an issue. It looks like the rain fly is tied out pretty far away which leaves only the bug net. However, two people sleeping and breathing all night in 15 degree temps can really cause some condensation. The coldest I’ve taken the Flite was about 35°F with two people. No issues. We used inflatable pads, which overlapped at the foot end. Thanks for great writeup Derek. The Tentsile website doesn’t recommend this tent for anyone above 6’1. How tall are you? And do you agree with that warning? I’m 6’2 and the tent seems perfect except for the fact that it may be too small for me. I think you could make it work, but keep in mind that sleeping on your side or in a fetal position might be more comfortable than sprawling out head-to-toe. I’m 5’10’ and I felt I had plenty of room. Our 72-inch pads fit just fine with room to spare. 1) is it possible to take your bagpacks with you and leave them with no problem inside the tent at night? There’s plenty of storage space. But if you’re thinking you can store food or other odorous materials I would advise against that. Nylon is nylon and not much of a barrier to teeth and claws. Just wondering if you have tried the Dynemma Whoopie Slings setup as a way to lighten the load as i know the straps + ratchets are the heaviest parts and i love them on my hammock so would love to use it for Tentsiling! No, but that’s a great idea. I’d use a thicker Dyneema cord and then weigh the weight per foot to see what the difference is. Nice well comprehensive review ,I’ve just purchased the flight + as was finding our old jungle hammocks if used without a silTarp insufficient for monsoon season in the tropics ,hoping this will prove more comfortable and a tad lighter overall ( also loads of fun ) awaiting delivery ! !